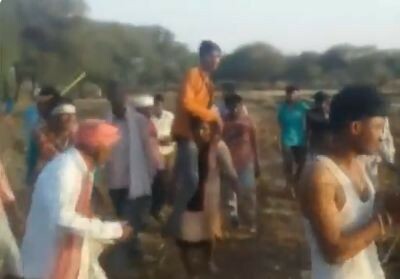 The Madhya Pradesh woman was forced to carry her husband on her shoulder by the residents of Devigar village in Jhabua district of Madhya Pradesh. As punishment for having an affair with a man from a different cast, a woman in Madhya Pradesh was forced to carry her husband on her shoulder and walk. The woman was made to do this by the residents of Devigar village in Jhabua district of Madhya Pradesh. The police came to know of the situation only when a video went viral of the woman, who is in her twenties carrying her husband on her shoulders. In the video that has been doing rounds on the internet, the villagers are seen making fun of the woman and making mocking noises as she is walks holding her husband on her right shoulder. Interestingly, the people present around the woman are all men and are smiling and laughing and some are even dancing while the woman is seen struggling to carry her husband and walk. The destination of the woman has not yet been ascertained nor has the events which took place after the ongoings in the video. The police registered a case against the villagers. "Some people in a group disrespected a woman in Devigarh, Jhabua. A case has been registered against all of them and two people have been arrested. We are trying to nab the rest of the accused," Vineet Jain, Superintendent of Police (SP) Jhabua, was quoted as saying by ANI. Caste discrimination and violence is not a rare occurrence in India. Many belonging to the lower strata of society have faced unfairness and injustice at the hands of what can be called upper caste people. In January a young 17-year-old boy in Odisha to carry his mother's corpse for five kilometres on a cycle for the final rites after none of the neighbours offered to help since he and his mother belonged to a lower caste. The boy had buried his mother in the firest nearby since he knew that he won't be allowed to bury her in the burial ground.